The internationally renowned Scottish band Cantrip will perform a rare Summer concert at Market Hall on Thursday August 9th. Cantrip is a leader in Scottish music. For two decades they have been breaking boundaries in the tradition, touring extensively throughout Scotland and the US. 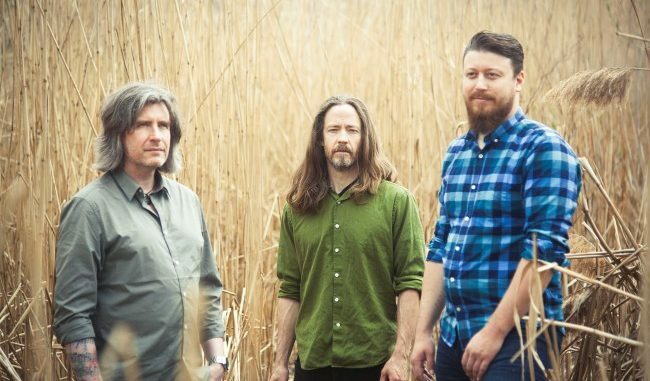 Known for their innovative arrangements, un-produced sound and dry wit this power trio can be seen on some of the largest Celtic stages in the world. The name is an Old Scots word meaning a charm, magic spell or piece of mischief and it aptly describes the unexpected twists and turns in their musical arrangements, likewise the compelling potency of their musicianship. Originally formed as a quartet, Cantrip sprung from a local session in Edinburgh nearly twenty years ago. Their driving music immediately caught the attention of the masses, and they were quickly signed to the Foot Stompin’ label. With their first album “Silver” (2001) in hand, Cantrip made its way across the water to the United States, where they were received with roars and shouts (of enjoyment). After years of significant touring, the band parted ways with Foot Stompin’ and began producing albums on their own. Two albums later (“Boneshaker” in 2005 and “Piping the Fish” in 2008), Cantrip had cemented itself as a perennial figure. After a period of hiatus in which children were born and continents were left for new ones, Cantrip redefined its sound. Trimming itself to a trio, the band tightened its arrangements while expanding its influence. New inspirations began creeping into the sound, complementing the traditional foundation of the band. This more mature sound debuted on their recent release “The Crossing” (2016) and has been catching the ear of listeners and concert goers all over again. Now, in recognition of 20 years of performing the band is returning to its roots and revisiting Silver, with a live re-release slated for Autumn 2018 that looks to be as exciting and full of energy as ever.